Posted by Jellio on February 03, 2007. If you enjoyed this story, read more like it in our Caption Competitions section. 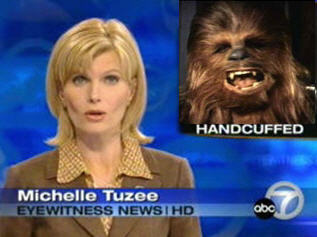 "...apprehended earlier this afternoon by an officer that witnesses say was 'a little short for a stormtrooper'." Posted by Your mom's new boyfriend. New York City Detective, Andy Sipowicz went on a rampage today. Panic erupted at this year's Fashion Week tents, as PETA's latest attempt at publicity involved the entire cast of VH1's Next Top Model, who hadn't shaved any body hair for six months, greeting guests at the front entrance. "The suspect pleaded that he had no idea that the Ewok was underage, and that the jar of Vaseline was simply for his chapped lips"
John Travolta sprouts extra hair! Film at 11.
after being told he had the right to remain silent the suspect responded "EUWWWWAAAAAAA"
With wookie acting jobs in short suply, and his money running low, Chewbaka began experimenting with harder drugs.